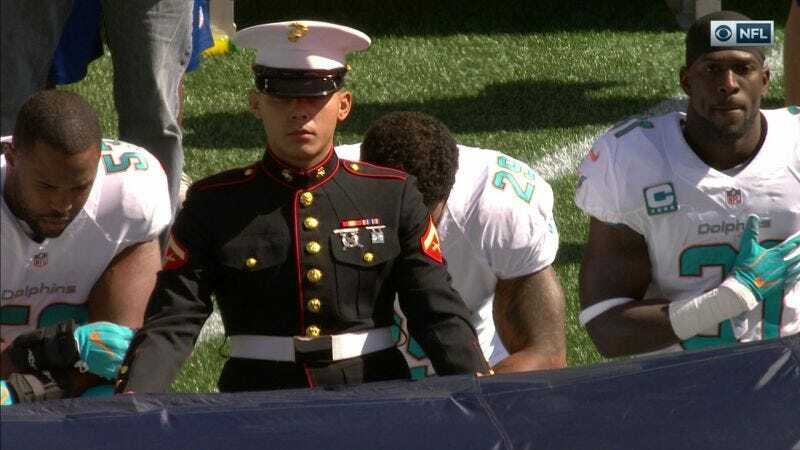 The Broward County sheriff’s union is calling for an end to police escorts that protect the Miami Dolphins in response to four players kneeling in protest during the national anthem last week. I respect their right to have freedom of speech. However, in certain organizations and certain jobs you give up that right of your freedom of speech temporary [sic] while you serve that job or while you play in an NFL game. Foster said taking a knee was a way to join Colin Kaepernick in speaking out against racial inequality and police brutality. The Broward Sheriff’s Office is currently being investigated by the Florida Department of Law Enforcement for last week’s fatal shooting of Gregory Frazier, who family members say was eating dinner in a lawn chair when he was shot and killed after police were called to the house for a domestic dispute.